You must be a member of the Rome French Culture Group to attend this activity. Would you like to join this group? Sandrine Kiberlain and Agathe Bonitzer star as two versions of the same woman in the latest feature by director Sophie Fillieres ('Pardon My French'). French writer-director Sophie Fillieres has a knack for making off-kilter dramedies about women under the influence, with films such as Good Girl, Pardon My French and If You Don’t, I Will showing them in various states of hilarity, disarray and despair. 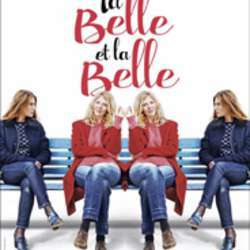 Her latest effort, When Margaux Meets Margaux (La Belle et la belle), doubles down on that premise by portraying not one but two such characters — who also happen to be the same person. If that sounds confusing, well, it sort of is, although that doesn’t stop this surreal two-hander from exuding its charms, with the winning duo of Sandrine Kiberlain and Agathe Bonitzer playing a woman at two stages in her life: one as she enters adulthood, the other as she reaches middle age. When we first meet 20-year-old Margaux (Bonitzer), she’s skirting through a dead-end job and relationship while trying to finish her Masters’ degree. At a party one night in Paris, she runs into 45-year-old Margaux (Kiberlain), who, without any clear explanation — there’s no hot tub time machine or 1.21 Gigawatts here — turns out to be herself as well. The encounter creeps Margaux 1 out, while Margaux 2 seems both amused and emboldened by the possibility to relive her youth again, offering her predecessor advice on how to avoid making the same mistakes that she did. Fillieres never tries to justify what’s happening, with her heroines expressing a very “je ne sais quoi” attitude toward this sudden rip in the space-time continuum. Rather, the film focuses on how les deux Margaux can use the event to better themselves in the eternal present — “I must absolutely change my life,” the younger Margaux texts at one point — as they both indulge in an affair with the same lucky man, Marc, (Melvil Poupaud), who they intermittently shack up with in his bachelor pad down in Lyon. If they share a guy and a soul, the two women have some notable differences. In her younger incarnation, Margaux seems lost and rather self-destructive — traits that perfectly suit an actress like Bonitzer (the daughter of Fillieres and director Pascal Bonitzer), who rarely cracks a smile onscreen. In her seasoned incarnation, Margaux is much more laid-back and wise, chuckling at her earlier foibles with the knowledge that she will one day grow out of them. With her warm demeanour and sharp comic instincts, Kiberlain (9-Month Stretch) is perfect for the part, playing a woman who’s given the chance to relive pivotal moments of her life with no apparent side effects.